When I told you I would be back soon with this month's edition of the Traveling Quilt Bee, I wasn't kidding! For October I was working on an all solid quilt for Erin. I decided to do a side piece of a half Lone Star, strip pieced from some solid jelly roll strips I had left over from my original Firecracker quilt. I used a tutorial from this Moda Bake Shop Tutorial to make my Lone Star, but only made half of a star -- four diamonds worth. Here's a shot in progress, with Miss Clara inspecting my work. My addition DOUBLES the quilt in size. I was a little worried about the scale and how much grey vs. color is in this section compared to the rest, but I think once more parts are added to the quilt, it won't be quite so stark of a difference. This lone star was actually really zippy to put together. Not having to worry about color order in order to make a pattern within the wedges (I just made sure the same color wasn't touching one another) made it much easier to add the strips as I went along. I actually ended up having enough strips to make a whole star so I might end up making myself a mini star at some point. Tanyia had my quilt this month and she added a row of blocks on one side. They just happen to be some of my favorite blocks, how did she know?!?! I love that she added larger 12 inch blocks next to last month's addition of 8 inch blocks. 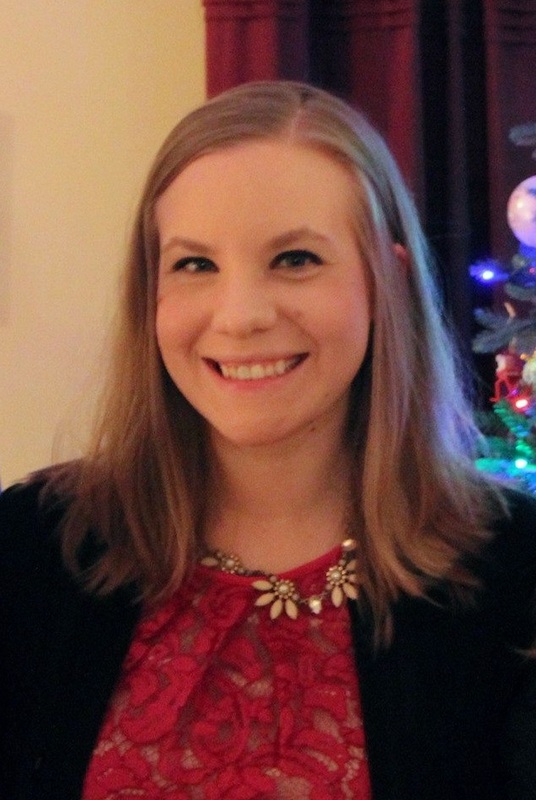 I also am crushing hard on the flying geese that she added too! Perfect way to break up the row and give it a more fluid feel. As of right now, my quilt is approximately 50 inches wide by 54 inches long, which is already big enough for a small throw and it still has TWO more stops before it will be returned to me. I think it will be at least 60 inches on each side (maybe not square, but it doesn't need to be) and then I can add on if I want to. Mine is actually one of the biggest ones in our group from what I can tell right now. It's actually almost the end of month #4 of The Traveling Quilt Bee, but I wanted to share about each quilt I have been working on separately. I will have this month's post up very soon! For the large side panel, I used a strip of grey solid approximately 12 inches wide by WOF long. I folded it in half three times, and put some random cuts in the folded piece. I added strips so that it was all reconnected, folded it up again, and sliced so that my new cuts intersected my original additions. I added more strips to reconnect it, folded and sliced a final time, sewed it all back together with some final strips, and then cut it to the width of the quilt section. This was REALLY fun. I wish I would have taken pictures of the process. The very lovely 8" paper pieced blocks on the left side are the latest addition to the quilt. I am very happy with the variety of sizes of the blocks thus far and how LARGE it is! It is approximately 36 x 60 currently! I have now completed all of my yellow Farmer's Wife blocks! Hooray! My favorite out of this bunch is definitely the Waste Not block. I even used fabric left over from my most recent Moda Bake Shop Quilt as the background. I was worried about a few of these being rather light, but I think in the grand scheme of the whole quilt they will work nicely. I have also managed to complete 4 of the last 12 blocks that need to be made. I decided to make 1-2 more blocks in each color. Thus far I have made a blue, a brown, a purple, and an orange. I have been going through some of my "newer" scraps to make these blocks so that they won't repeat too much from the previous group of colored blocks. I had a little mishap with my brown Wedding Ring block and had to sub in some solid brown after I ran out of my brown print. It's a little more subtle in person than it is in the picture, so I can live with it. I only have eight more blocks to go until I am done with all 111 blocks! Wow! Doing this as part of the rainbow scrap challenge has been a great choice to manage the blocks and not get overwhelmed in making them, so if you are looking for a project for next year's RSC, I would recommend the Farmer's Wife blocks! 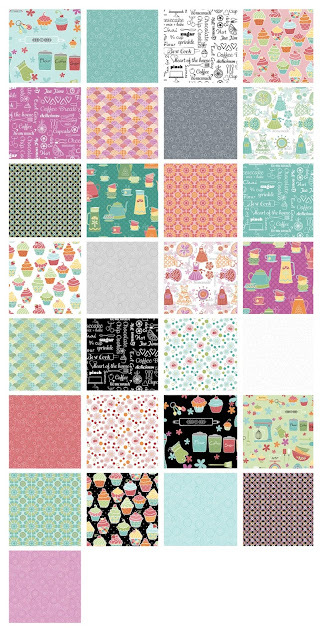 Don't forget to click on over to this post to enter to win a fat quarter bundle of Kitchen Love! 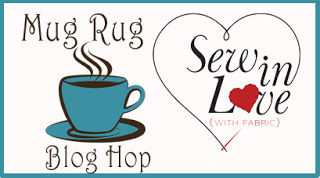 Mug Rug Hop -- Featuring Kitchen Love! Today I am over at the Benartex blog, Sew in Love with Fabric, sharing a tutorial as a part of their Mug Rug Blog Hop! I decided to use the Kitchen Love line, because I love to cook and bake. The prints are just darling in this collection! My mug rug is obviously kitchen inspired -- and as a little twist, this mug rug could also be used as a washable spoon rest! Hop on over to Sew in Love with Fabric to check out the tutorial! This month I got my "assignment" done early! This month we made half hourglass units and full hourglass units. Three "flavors" of half hourglass units, one "flavor" of full hourglass units. For those of you who are also playing along, my dark teal ziggy stripe is my Fabric B, the pansy print is my Fabric C, the purple floral is Fabric D, and the pink dot is my Fabric E/background. Unlike last month, where we put together a whole block from the units we had made, we just made sub-units this month. I continue to be very happy with my color choices, and surprisingly pleased with the contrast between my fabrics. Of course, I still have lots of unused pieces left in my box, so we will continue to see how this quilt evolves! Time to share my last two months' worth of Stash Bee blocks! This is going to turn out so lovely! 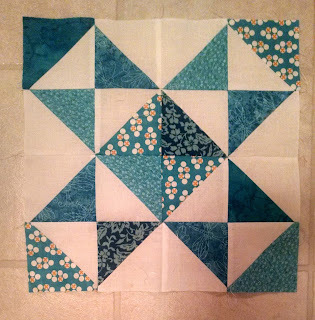 While I'm not usually a big fan of stitch and flip flying geese, these blocks are COOL. With the way the colors are arranged, lots of secondary (and tertiary!) pinwheels are created when blocks are combined. The navy that I used was quite dark, so I used the black polka dot print to give it a little more contrast. This month is our last month for making blocks in the Rainbow Scrap Challenge -- the next two months are for top-making and quilting. October is yellow with orange accents. These two colors happen to be the colors I think that I have the least of. It seems like there are a lot of basket-style blocks this month! I apologize if some of the blocks are hard to see -- not a ton of contrast in some of these blocks. I had to scrap my #92 - Streak of Lightning block because I messed up and didn't have enough of the fabrics I wanted to use to complete it! Whoops. I think my favorite out of these six is the Temperance Tree block -- I used a fun yellow and teal bird print that I just had a little bit of. It ended up being perfect for this block! Five more yellow blocks to go, then I have 12 to make in a variety of colors to get to the final tally of 111 blocks. In my efforts to catch up this week, I'm finally getting to sharing some of my pictures of the quilts at the fair! Here's the Best of Show in Quilts -- it was a cream whole cloth quilt with absolutely gorgeous brown long arm quilting. Unlike years past where each category was grouped together, there didn't seem to be a pattern to how the quilts were arranged. The Hawaiian quilt in the lower right was absolutely gorgeous. Sighted: modern fabric! This tends to be a very traditional showing of quilts but I was very excited to see all of the Alison Glass prints in the second quilt on the top row. Next to it you can see my Wishes sampler quilt, which also won a third place ribbon. The kitty in the daisies wall hanging at the bottom right was also exquisite! More lovely quilts. The tree is a family tree with names on it! Very creative. Finally here's my Wallflowers row quilt (pattern here!) I actually decided to enter this quilt because it was a slightly more traditional quilt (only slightly!) and it was the only one that didn't win a ribbon. There were probably 10 quilts entered into this category so that might have also played against it as well. Enjoy your Thursdays everyone. It's a very foggy day here but hopefully we'll see the sun later! 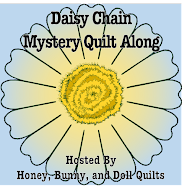 I definitely didn't finish the September installment of the Meadow Mystery QAL in September, but I did finish before the October instructions come out tomorrow! I actually made and trimmed all of my HSTs rather early in the month and then had to shift my attention to my Favorite Frames quilt. I just finished up my Block 6 units this weekend. I was slightly worried about the contrast between Fabrics C and D, but I am extremely happy with how my Block 6 units turned out! If you haven't joined in yet, there is plenty of time to join in! Hop on over to Meadow Mist Designs to it check it out! 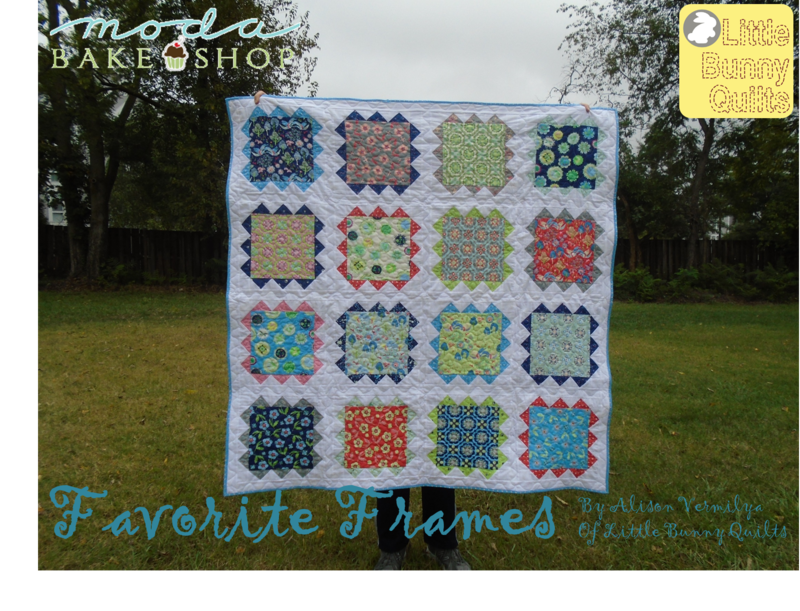 Favorite Frames -- New Pattern at Moda Bake Shop! 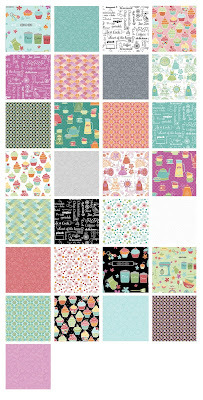 I am back over at Moda Bake Shop with a fun quilt that can be made from a single layer cake and yardage! This project is perfect for those fabric lines that have large scale prints that you want to show off (or don't have the heart to cut into!) It's small enough for a baby quilt but big enough for a throw to keep for yourself. This quilt finishes at 55" x 55". Rather than sharing the whole tutorial here (you can click over to MBS to get it! 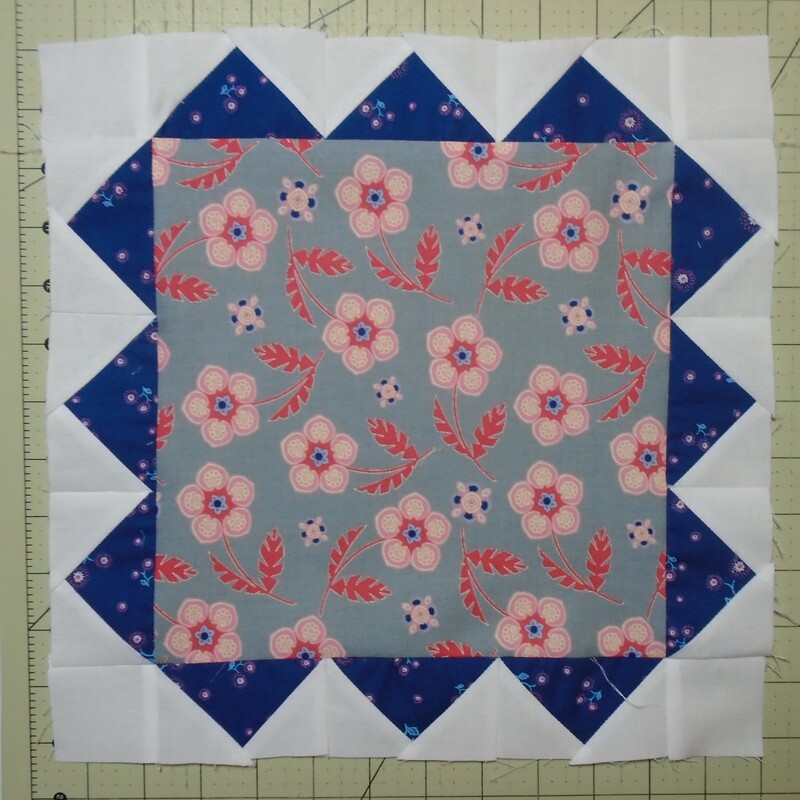 ), here's what you need for one block -- if you want to change up the size of the quilt or the setting! Draw diagonal lines on your 2 3/8 inch squares. Layer two squares atop each of your 4 1/4 inch squares, sew 1/4 inch away from the diagonal line, cut apart on the diagonal line. Press. 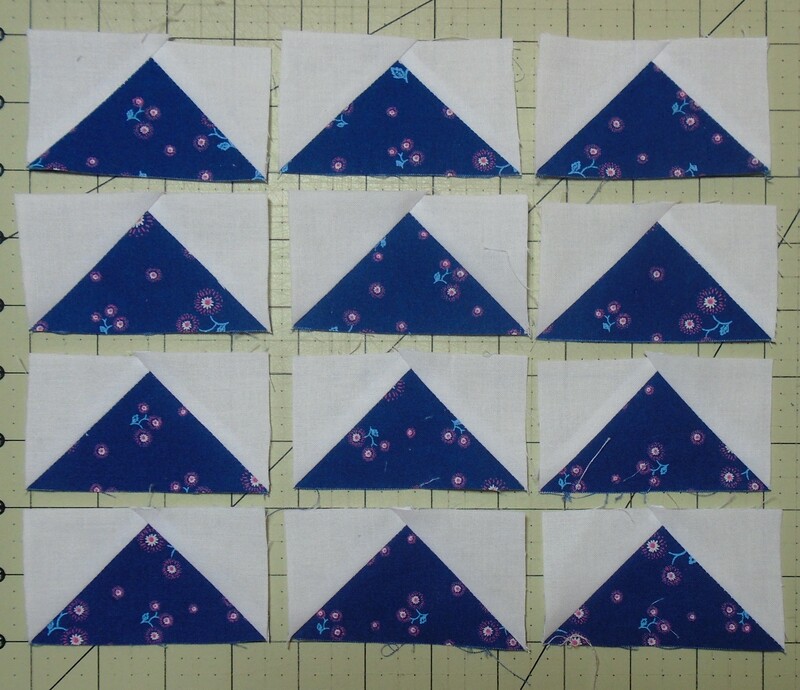 Repeat with the remaining 2 3/8 inch squares, sew 1/4 inch from the diagonal line, cut apart on the line, and Press. Trim off dog ears. 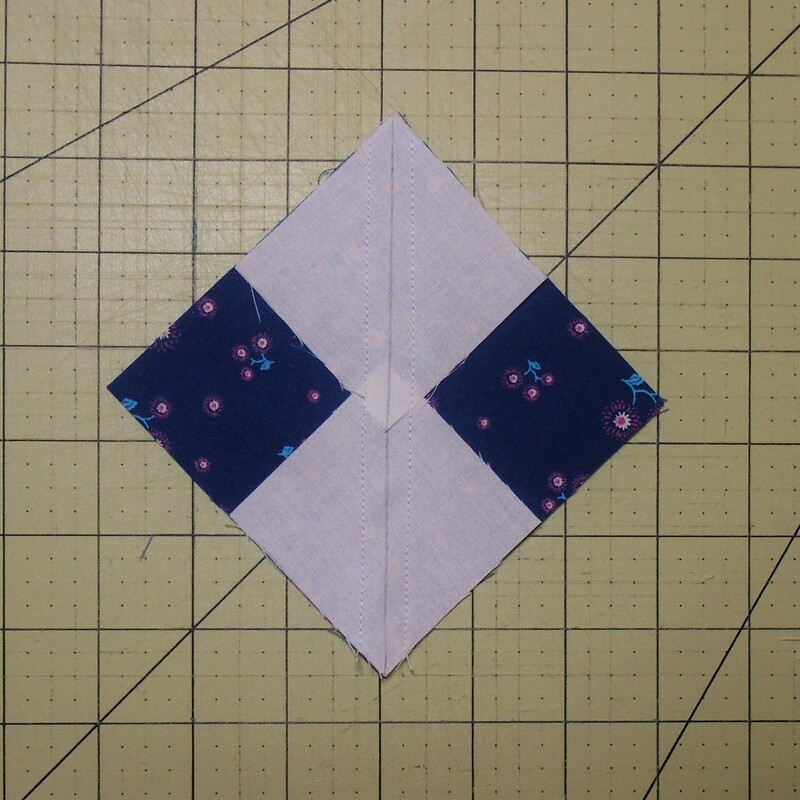 You will need twelve (12) flying geese for each block. Sew your flying geese into four sets of three geese each. 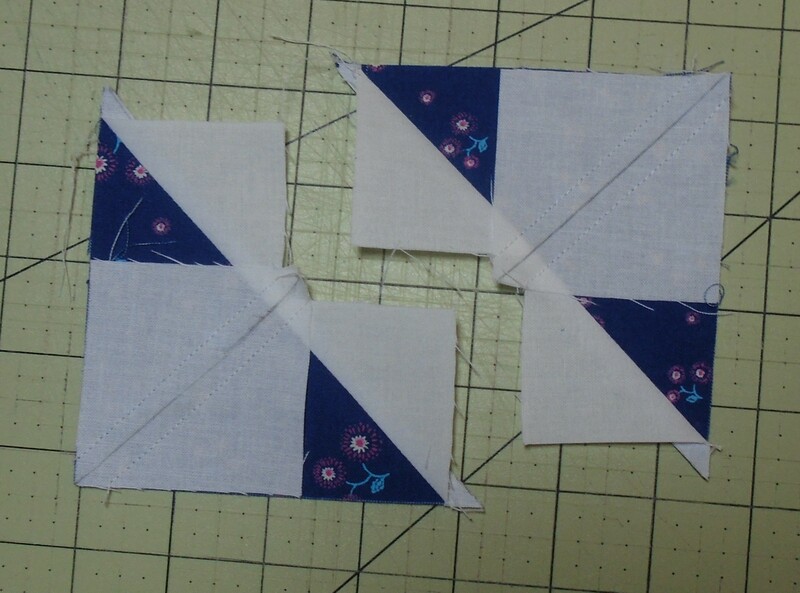 Lay out your block as shown below and sew together. 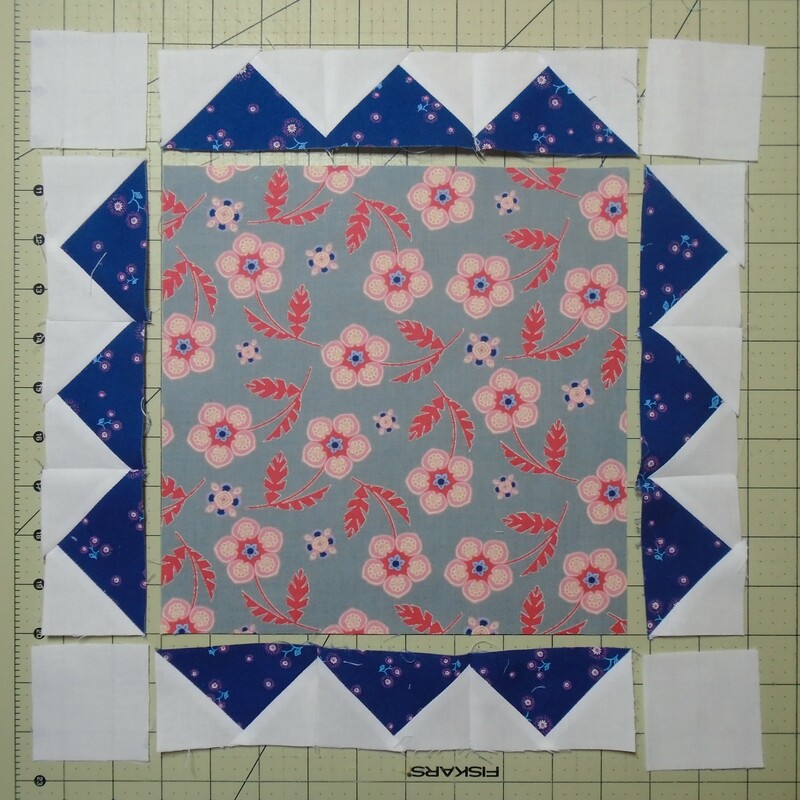 This is a fun 12" finished block to use for samplers and swaps. Additionally, you can swap out any 9" finished (9.5" unfinished) block for the center square to really make this your own! For the quilting, I "fussy quilted" this quilt. 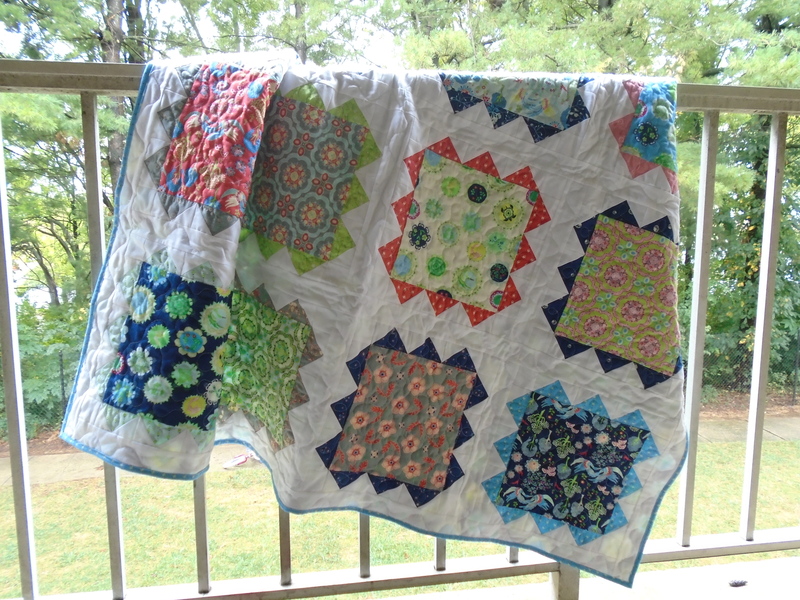 I did loop de loops around the "frames in the flying geese and quilted a meander in the large focus fabric squares. In the sashings, I did a standard squiggle across the whole quilt. Nothing terribly fancy, but something fun and different than my standard fillers. Click on over to Moda Bake Shop to see the full quilt tutorial! Sharing at Sew Cute Tuesday, Fabric Tuesday, and Finish it up Friday! It might be the start of a new month in the RSC but I just finished up all of my September blocks! For Star Gardener, I picked out the small pieces of my scraps and used a whole bunch of them up. Some of the colors repeat once, but many are only used once! These are some of my favorites so far! Sharing at Scrap Happy Saturday and Building Blocks Tuesday!